The VuHaus stations film local, emerging and established artists playing live music in their studios, on location, and in intimate settings, with one-of-a-kind interviews, and live performance streams. VuHaus curates this exclusive content providing a single platform for music discovery in an ever-expanding video collection from America’s most vibrant music scenes. VuHaus is a non-profit, non-commercial organization comprised of public media's leading Music Discovery stations. The VuHaus network includes WFUV in New York City, KCRW in Los Angeles, WXPN in Philadelphia, KUTX in Austin, KTBG The Bridge in Kansas City, KEXP in Seattle, KXT in Dallas/Ft. Worth, opbmusic in Portland, Mountain Stage in West Virginia, KDHX in St. Louis and Live From The Fort in Vermont. VuHaus received initial funding from the Corporation for Public Broadcasting and is operated by its founding partner Public Media Company, a national non-profit organization focused on maximizing the impact of public media through innovation and strategic partnerships. Public radio music stations are the engines for local and national music discovery and are the premiere conduit between artists and their fans.These stations are constantly finding the next artists and songs that will be household names soon. Artists love interacting with the Music Discovery public radio stations in VuHaus because of the real and meaningful connections they make with their fans through station concerts, in-studio performances and events. Boulder, CO (March 9, 2017) – VuHaus adds a new Colorado affiliation to its growing network of public media organizations. The ‘VuHaus Colorado’ page is a collaboration of six public radio stations in the state that are part of the Colorado Music Strategy, a partnership between Colorado Creative Industries and Bohemian Foundation. VuHaus is the country-wide collective of the most influential public media stations, showcasing their music video content at VuHaus.com. Initial stations include KJAC-FM “The Colorado Sound” in Greeley-Ft. Collins, KRCC-FM in Colorado Springs, KSJD-FM in Cortez, KVNF-FM in Paonia, KSUT-FM in Durango and KRFC-FM in Ft. Collins. These stations joined forces to curate an all-Colorado local page on VuHaus.com/Colorado. Other Colorado public radio stations are expected to join the collaboration soon. In celebration of the new VuHaus Colorado page, The Colorado Sound will engage a 6-person video crew to film their first birthday on March 9, 2017 at the Aggie Theater in Fort Collins. The event includes an all Colorado artist line-up, including Paper Bird, Brent Cowles, Dragondeer and Rob Drabkin. Based in Fort Collins, Colorado, Bohemian Foundation is a private family foundation that supports local, national, and global efforts to build strong communities. Founded in 2001 by philanthropist Pat Stryker, Bohemian Foundation takes its name and inspiration from the bohemian movement of 19th century Europe. We believe that by working together, we can build stronger communities. The Colorado Sound is Colorado’s Home for Music Discovery. Broadcasting at 105.5 FM on Colorado’s Front Range, and on 88.9 FM in Steamboat Springs, the non-commercial, listener supported station plays a combination of emerging and established artists, blending rock, blues, soul, local music and more, reflecting Colorado’s unique lifestyle. The Colorado Sound is an active part of Colorado’s vibrant music scene, and contributes to Colorado’s rich musical heritage through the development and promotion of Colorado music. KRCC strives to be the premier public multimedia hub for discovery, engagement, and civil discourse. Through rigorous reporting, impactful storytelling and thoughtful music curation, 91.5 KRCC serves those seeking knowledge and an authentic connection to Southern Colorado and the world at large. KSJD informs, entertains and empowers the people of the Four Corners Region of Arizona, Colorado, New Mexico and Utah, including the Ute Mountain Ute Tribe and portions of the Navajo Nation. KSJD provides news, information and entertainment through its public radio service and The Sunflower Theatre. KVNF Community Radio has been serving the western slope of Colorado since 1979 with news programs from National Public Radio, alternative news programming, local news and current affairs and an eclectic mix of musical genres with an emphasis on independent recording artists. KSUT is a community supported public broadcasting organization serving the communities of the Four Corners, providing diverse and eclectic entertainment, education, news, and information while promoting multicultural awareness and understanding. Founded in 1976 by the Southern Ute Tribe, KSUT is an NPR and PRI affiliate and was one of the first stations in the country to be licensed to a Native American tribe. For 14 years, volunteer-powered KRFC has been the soundtrack of northern Colorado. With an early mission to support local musicians, we helped launch the careers of notable Colorado artists Nathaniel Rateliff, SHEL, and Gregory Alan Isakov (as well as many others) by featuring them on our signature program, Live@Lunch, and playing their tracks before any other station picked them up. Based in The Music District, KRFC is Fort Collins' only locally-focused community radio station. VuHaus (pronounced “view house”) is a collaboration of public radio and television stations from across the country, deeply rooted in their local music communities. We share a common mission to support artists and be a source of music discovery for audiences around the world. VuHaus is a non-profit, non-commercial organization, with an aim to be true partners to artists while providing a unique window into the country's most vibrant music scenes. The VuHaus network includes public radio stations WFUV in New York City, KCRW in Los Angeles, KXT in Dallas/Ft. Worth, WXPN in Philadelphia, KEXP in Seattle, KDHX in St. Louis, opbmusic in Portland, KUTX in Austin, KTBG The Bridge in Kansas City, Mountain Stage in West Virginia, WGBH in Boston, Vermont Public Radio, Houston Public Media and Colorado’s KSUT, KVNF, KSJD, KRCC, KRFC and The Colorado Sound. VuHaus received initial funding from the Corporation for Public Broadcasting and is operated by its founding partner, Public Media Company, a national non-profit organization focused on maximizing the impact of public media through innovation and strategic partnerships. 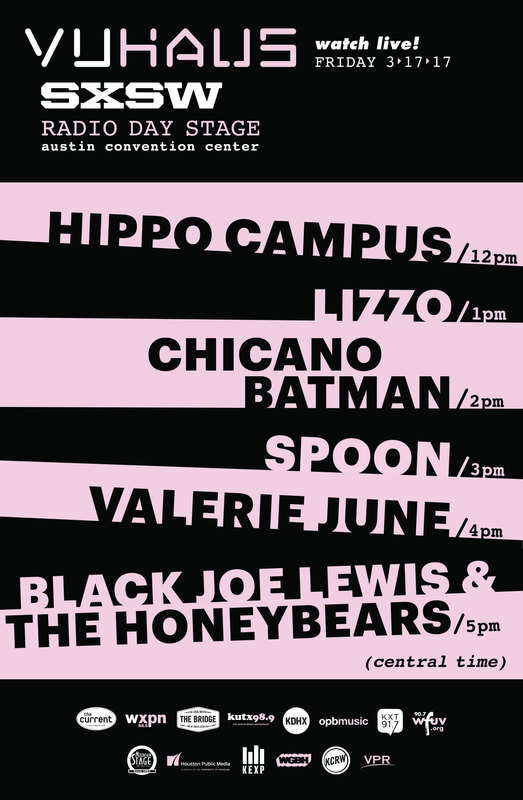 The event is open to all with SXSW badges. Online and mobile viewers can watch live on VuHaus.com, via the VuHaus stations’ websites, NPR Music or SXSW.com. WFUV / New York, KXT / Dallas, and KUTX / Austin will also provide a live on-air broadcast of the Radio Day Stage. "The line-up this year is incredible,” states Mark Abuzzahab, VuHaus program director. “The Radio Day Stage reflects the diversity you hear every hour on all of the VuHaus stations. Where else can you go from Lizzo to Spoon other than non-commercial radio?" VuHaus is a collaboration of public radio and television stations from across the country, deeply rooted in their local music communities. We share a common mission to support artists and be a source of music discovery for audiences around the world. VuHaus is a non-profit, non-commercial organization, with an aim to be true partners to artists while providing a unique window into the country's most vibrant music scenes. VuHaus (pronounced “view house”) is a non-profit, non-commercial organization comprised of public media’s leading Music Discovery radio stations and public TV stations. The human-curated, state of the art music discovery video platform features performances from the studios and events of the participating stations, and is available via mobile and web. The VuHaus network includes public radio stations WFUV in New York City, KCRW in Los Angeles, KXT in Dallas/Ft. Worth, WXPN in Philadelphia, KEXP in Seattle, KDHX in St. Louis, opbmusic in Portland, KUTX in Austin, KTBG The Bridge in Kansas City, Mountain Stage in West Virginia, WGBH in Boston, Vermont Public Radio and Houston Public Media. VuHaus received initial funding from the Corporation for Public Broadcasting and is operated by its founding partner Public Media Company, a national non-profit organization focused on maximizing the impact of public media through innovation and strategic partnerships. There’s too much good music for just twelve days or eight nights. That’s why VuHaus, the gathering place for public radio’s best music videos, is rolling out fourteen whole days of year end celebrations. Looking back at 2016, the VuHaus stations have had some incredible performances come through their doors. Each station has gone through and hand picked their favorite top 10 performances of 2016. Each weekday, December 13-30, 2016, VuHaus will feature a new video playlist from each of these stations. Ludovico Einaudi, Iggy Pop, Lush, Avett Brothers, The Kills, Angelique Kidjo, Funkadelic (featuring George Clinton & Parliament), Wilco, Mayer Hawthorne, Andrew Bird, Charles Bradley, GoGo Penguin, Lake Street Dive, Okkervil River, PWR BTTM, Regina Spektor, Seratones, Sunflower Bean, and Violent Femmes are just a sampling of what you will see on these Best of 2016 Playlists. The playlists feature favorite artists and surprising newcomers. They capture the local flavor and scene of the station’s home cities, as well as highlight the platform’s penchant for getting international stars to give their all. The varied offerings have one thing in common: They will be all about the music, and they will all be awesome. "The tastemakers at VuHaus stations invite hundreds of artists to perform each year, and these playlists are the best of the best,” says Mike Henry, Brand Manager at VuHaus. “This is the easiest way to revisit your favorite performances of the past year or to discover new artists." VuHaus (pronounced “view house”) is a non-profit, non-commercial organization comprised of public media’s leading Music Discovery radio stations. The human-curated, state of the art music discovery video platform features performances from the studios and events of the participating stations, and is available via mobile and web. The VuHaus stations film local, emerging and established artists playing live music in their studios, on location, and in intimate settings, with one-of- a-kind interviews, and live performance streams. VuHaus curates this exclusive content providing a single platform for music discovery in an ever-expanding video collection from America’s most vibrant music scenes. The VuHaus network includes WFUV in New York City, KCRW in Los Angeles, WXPN in Philadelphia, KUTX in Austin, KTBG The Bridge in Kansas City, KEXP in Seattle, KXT in Dallas/Ft. Worth, opbmusic in Portland, Mountain Stage in West Virginia, KDHX in St. Louis, Vermont Public Radio, and WGBH in Boston. VuHaus received initial funding from the Corporation for Public Broadcasting and is operated by its founding partner Public Media Company, a national non-profit organization focused on maximizing the impact of public media through innovation and strategic partnerships. Boulder, CO (November 28, 2016) – VuHaus is proud to announce the addition of Houston Public Media as its newest affiliate. VuHaus, the music discovery video platform for public media, is a growing network of public media organizations who share a common mission to support emerging and local artists, and to introduce their music to new audiences. VuHaus content originates from the country’s most trusted radio tastemakers. Houston Public Media will join public radio stations WFUV in New York City, KCRW in Los Angeles, KXT in Dallas, WXPN in Philadelphia, KEXP in Seattle, KDHX in St. Louis, opbmusic in Portland, KUTX in Austin, KTBG The Bridge in Kansas City, Mountain Stage of West Virginia Public Broadcasting, and Vermont Public Broadcasting, along with WGBH in Boston. “We are excited to embark in this partnership with VuHaus, not only to support our local artists and give them greater exposure, but also to introduce our audiences to new emerging artists across the country,” said Joshua Adams, executive director of operations of Houston Public Media. Houston Public Media’s Skyline Sessions will be curating a Houston channel [www.Vuhaus.com/Houston] on the VuHaus platform. Skyline Sessions showcases exceptional music performances by artists based in Houston and beyond. The state-of-the-art George B. Geary Performance Studio, located just southeast of downtown Houston, hosts musicians in an intimate setting with an emphasis on capturing the unique experience of live studio recording. In addition, and as a celebration of Houston Public Media joining VuHaus, a live webcast will be streamed on VuHaus on Friday, Dec. 2, 2016 starting at 5:00 p.m. CT. The show will feature Houston rapper Fat Tony performing from a rooftop downtown. Watch it live here. Houston Public Media combines broadcast and digital assets to serve residents of Southeast Texas with a curated mix of trusted local news and entertainment with exceptional national programming from NPR and PBS. Houston Public Media is a public service from the University of Houston, its license holder, and is supported with financial gifts to the Houston Public Media Foundation. With a combined weekly audience of more than 1.5 million, Houston Public Media is committed to delivering content that expands minds and possibilities with trusted information. The VuHaus network includes public radio stations WFUV in New York City, KCRW in Los Angeles, KXT in Dallas/Ft. Worth, WXPN in Philadelphia, KEXP in Seattle, KDHX in St. Louis, opbmusic in Portland, KUTX in Austin, KTBG The Bridge in Kansas City, Mountain Stage in West Virginia, Live From the Fort in Vermont, WGBH in Boston, Vermont Public Broadcasting and Houston Public Media. VuHaus received initial funding from the Corporation for Public Broadcasting and is operated by its founding partner Public Media Company, a national non-profit organization focused on maximizing the impact of public media through innovation and strategic partnerships. From all the amazing performances of 2016, VuHaus has chosen its top 10 artist discoveries of the year. Here is a ranked list of the best performances of 2016 from promising young bands that VuHaus wagers we will all be hearing and seeing a lot more of in the future. The New York-based duo’s weirdly wonderful pop songs have been a favorite on KCRW’s airwaves for months. From their humble beginnings on a college campus, the genre-defying Magna Carda has risen to the top of the Austin music scene as the premier hip hop act of 2016. With their pop-infused melodies, heavy beats, drum hits and swooning vocals, the Philadelphia-based band has drawn comparisons to a multitude of artists, ranging from Sir Sly and The Neighbourhood to Lana Del Ray. This indie rock band from St. Louis is high-energy art-rock that goes straight to the brain’s pleasure center. Marcus Harris, known artistically as MH the Verb, has become one of the East Coast region’s most promising multi-media artists as a performer and producer. This ever-evolving Brooklyn based project takes listeners on a journey through magical dream worlds and vivid musical landscapes with its romantic, imaginative pop music. Quaker City Night Hawk’s brand of hard rock n’ roll is bred from Texas boogie, Memphis soul, and heavy blues. French and American duo, Hypem chart toppers, SXSW 2016 Official Artists, as seen on tour with Stromae and heard on Netflix’s LOVE. This 9-piece soul sensation from Seattle delivers hip-swinging, booty-shaking, heart freeing music that is setting the course as the next hot soul and funk number ready to sweep the nation. Battleme is the monikier and band of American musician and Lions singer Matt Drenik. Commercial media has largely abandoned local and emerging music acts, hunting down pageviews, eyeballs, and other numbers. Yet there are other metrics, ones that favor innovative, risk-taking artists and spaces that welcome them with elements like artistry, complexity, and social impact. Many listeners want to find music with these qualities, not just hear more about the same pop celebs and legacy stars. This resulting discovery void has pushed more and more fans to seek out new ways to find intriguing, emerging bands. One place many music lovers have flocked: public radio. These listener-supported stations, freed from profit-driven models, are doing more than sending out new recordings over the airwaves. They are also producing immense amounts of online content like in-studio performance videos and streams of live sets. Thanks to the not-for-profit music video app and platform VuHaus, public radio stations can now showcase this content collectively in one place, to bolster artists on-the-rise from their local music scenes. As an extension of the stations, the platform’s status as a non-profit organization frees it from commercial pressure. Because VuHaus is owned by the public radio stations it serves, like KCRW in Los Angeles, WFUV in New York City, KUTX in Austin, WXPN in Philadelphia, they answer only to the tastes of programmers and the demands of their audiences. This collective ownership and non-profit status provides VuHaus and their stations the flexibility to allow artistic quality and relevance to dictate curation. Producers and programmers from the stations themselves were consulted for every step of the design process, ensuring that their listeners and the fans of emerging music would be well served by the platform. This approach works well for artists, as public radio has been breaking bands for decades: R.E.M. in the ‘80s, Beck in the ‘90s, Mumford and Sons in ‘00s and Adele in ‘10s, just to name a few. Public radio stations have a proven record for not only recognizing a good band before everyone else, but for fostering a meaningful connection to a scene’s artists, local venues and festivals, and most importantly the fans and listeners, who are the true power behind artists’ careers. In the era of adblockers, bot views, and other advertising struggles, media platforms with bona fide high-quality audiences are a media buyer’s dream. VuHaus, the national platform curating more than a dozen music-centric public radio stations’ video sessions into one streamlined site, makes this dream a reality, thanks to strong content and young, savvy viewers loyal to the site’s musical dedication. VuHaus occupies a rare niche in the online advertising world: Part mission-driven nonprofit, part tech-driven national platform with a strong mobile presence. The platform has the agility and targeting abilities of bigger competitors, but keeps the focus, smarts, and non-commercial vibe of public radio intact. Many advertisers know the value of this audience, but it wasn’t until VuHaus that a national advertising platform based on some of public media’s most popular assets--its music curation and coverage--existed. Working with individual stations just didn’t make sense for companies like Verizon or Comcast, who collaborated with VuHaus to focus their efforts in particular geographic regions. Moreover, VuHaus’ audiences trend younger. VuHaus works directly with advertisers on all fronts, including coming up with the right creative. One recent example: Automaker Subaru wanted to reach just the right demographic, the hip, savvy younger adults associated with its lifestyle. VuHaus suggested the company expand on its existing content and craft something just for the platform, a charming preroll where spinning tires turns into spinning vinyl. Boston’s WGBH has joined VuHaus and is now live on VuHaus.com. VuHaus, the music discovery video platform for public media, is a growing network of public media organizations who share a common mission to support emerging and local artists, and to introduce their music to new audiences. VuHaus content originates from the country’s most trusted radio tastemakers: WFUV in New York City, KCRW in Los Angeles, KXT in Dallas, WXPN in Philadelphia, KEXP in Seattle, opbmusic in Portland, KTBG The Bridge in Kansas City, KUTX in Austin, Mountain Stage of West Virginia Public Broadcasting, KDHX in St. Louis, and Live From the Fort of Vermont Public Broadcasting. WGBH music performance series, “Front Row Boston,” will be curating a Boston channel [http://www.VuHaus.com/boston] on the VuHaus platform. Front Row features performances by local legends and emerging talents alike, across multiple genres, in the authentic, first-person experience of a live show. A sample of Front Row presentations includes performances by the Punch Brothers, St. Paul & the Broken Bones, and Jason Isbell. In addition to performances recorded in Boston-area venues, the series now will include performances recorded in WGBH’s on-site, state-of-the-art performance spaces. “It’s an honor to join this network of incredibly talented stations producing great video content. The VuHaus platform adds an exciting opportunity to share the work we’ve been doing in Boston with viewers across the country,” said Greg Shea, Executive Producer, Front Row Boston. WGBH Boston is America’s preeminent public broadcaster and the largest producer of PBS content for TV and the Web, including Masterpiece, Antiques Roadshow, Frontline, Nova, American Experience, Arthur, Curious George, and more than a dozen other primetime, lifestyle and children’s series. WGBH’s television channels include WGBH 2, WGBX 44, and the digital channels World and Create. WGBH TV productions focusing on the region’s diverse community include Greater Boston, Basic Black and High School Quiz Show. WGBH Radio serves listeners across New England with 89.7 WGBH, Boston’s Local NPR®; 99.5 WCRB Classical Radio Boston; and WCAI, the Cape and Islands NPR® Station. WGBH also is a major source of programs for public radio (among them, PRI’s The World®), a leader in educational multimedia (including PBS LearningMedia™, providing the nation’s educators with free, curriculum-based digital content), and a pioneer in technologies and services that make media accessible to deaf, hard of hearing, blind and visually impaired audiences. WGBH has been recognized with hundreds of honors: Emmys, Peabodys, duPont-Columbia Awards and Oscars. Find more information at wgbh.org. The VuHaus network includes WFUV in New York City, KCRW in Los Angeles, WXPN in Philadelphia, KUTX in Austin, KTBG The Bridge in Kansas City, KEXP in Seattle, KXT in Dallas/Ft. Worth, opbmusic in Portland, Mountain Stage in West Virginia, KDHX in St. Louis, Live From the Fort in Vermont and WGBH in Boston. VuHaus received initial funding from the Corporation for Public Broadcasting and is operated by its founding partner Public Media Company, a national non-profit organization focused on maximizing the impact of public media through innovation and strategic partnerships. It’s fairly easy to find cool new things from beloved artists, if you know where to look. When kd lang, Niko Case, and Laura Veirs premiered their new collaborative project, for example, there was one place to hear it first. When Ray LaMontagne wanted to give back to his fans and supporters by playing his album in full right before its release, you could only find it one place on the web. That place is VuHaus, the platform that gathers the best in video from tastemaker public radio stations around America. Though its premieres and exclusive live streams draw people to the site, VuHaus’s approach to curation ensures that viewer exploration doesn’t stop with the familiar. It carefully curates videos to enable music discovery. Built to boost emerging artists and give fans a fresh look at beloved musicians, VuHaus’s curation approach follows in the footsteps of its public media creators. The curation process is human driven at all points. There are no strange suggestions based on past listening, no leaps of machine learning that lead to out-there outbursts or repetitive tracks. Stations pick which artists to invite, how to capture their performances, and what videos to upload to the VuHaus platform. Many sessions happen in the stations’ studios, but others are shot in creative locales that add serious visual appeal. This may mean Mudhoney playing a dizzying set on top of the Space Needle, or musicians jamming in a canoe in the middle of a Texas lake or in the resonant ruin of a retired power station. After it’s uploaded to the platform, the VuHaus team works with the video, tagging related artists on VuHaus, creating thematic playlists, and juxtaposing big names and emerging artists, as well as genres and sounds. “If you watch a performance on VuHaus, it will suggest artists based on that artist. We think these suggestions are better done by humans,” says Abuzzahab. The videos capture the kind of moment only to be found on public radio, like when a certain Star Trek veteran made a cameo in a surf rock band’s session. “There is a great session with Taco Cat, who were doing a video at KEXP,” recalls Abuzzahab. “George Takei happened to be in the studio for an interview, and he liked the band so much he jumped in and started doing this fun, goofy dance.” Only on public radio, and visible only on VuHaus. Public radio stations around the country were early in the game of shooting high-quality video of musical guests--big names, indie darlings, emerging voices--who come by the studio. Now VuHaus gathers these once-scattered treats onto one sleek, discovery-enabling platform. With new video coming regularly from music heavyweights like KCRW (LA), WFUV (NYC), KEXP (Seattle), and KUTX (Austin), as well as from established names like Mountain Stage, and WXPN (Philadelphia) / World Café, VuHaus bursts with eclectic sights and sounds. Genre-agnostic, the site’s curation team and special guest artists put together timely and thematic playlists, and introduce new artists of note. Before VuHaus, public radio stations in major markets were hosting video sessions and tossing them up on YouTube. Musicians would stop by, lay down some amazing performances, and that was that. While the resulting videos would garner views aplenty, they didn’t capture the stations’ spirit, keep viewers engaged, introduce them with similar bands, or help music fans benefit from public radio’s proven track record of uncovering the best in music. “Stations were invested in video, but weren’t getting anything out of it,” notes Mike Henry, a long-time public radio consultant and one of the driving forces behind VuHaus. “They started a dialog between themselves. We sat down and decided on a website, a branded way to face the consumer that wasn’t overtly public radio.” The interface is purposefully minimalist and easy to navigate. It’s a powerful platform for established musicians to debut new work. Jason Isbell, for example, decided to play material from his new album a few weeks before its release, as an exclusive at KUTX in Austin, and the video blew up on VuHaus, the only place it was available online for his fans. The platform is also a boon to independent and emerging artists, for whom a station session may be their first high-quality, multi-camera shoot. VuHaus powers discovery through careful curation, putting artistry first. Humans are involved at every step of the process: Stations book the bands, produce the sessions and submit their videos, and then VuHaus’ in-house curators classify and spotlight them. “Related Artists” are determined by people, not algorithms. Artists themselves are invited to create playlists of their favorite fellow performers or songs. Greg Holden spent hours watching and creating his. There’s an advantage for stations, as well as listeners/viewers and artists. Unified, they carry more weight and can have a national presence, a benefit to ensure public radio expands, moves forward, and continues to serve its audiences in evolving ways.